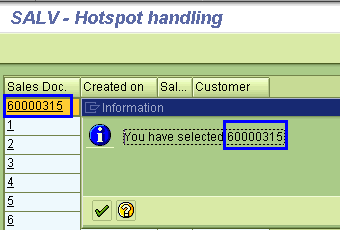 In the series of the SALV model table display, today we will see how to add the hotspot and after adding, how to handle that hotspot. You can find all the previous discussion at Tutorials > SALV Table Display . Hotspot is useful in most of the ALV reports to drill-down from the main list. For example, in the Sales order report, it would be great if we provide a drill-down to VA03 (Sales Order display). By this way users would have better flexibility to look into the respective document information. To add the Hotspot, we need to get the object reference of the CL_SALV_COLUMNS_TABLE from the ALV object (reference to CL_SALV_TABLE). This object reference contains the properties related to ALL the columns. For implementing HOTSPOT, we need to change the specific column properties (i.e. Sales Order or Customer). For this purpose, we need to have an access of the object reference CL_SALV_COLUMN_TABLE – which will contain the properties of the speicific column. We will set the specific Cell type for the HOTSPOT. Here we will use the Casting concept of the Object Oriented to refer the properties of the CL_SAL_COLUMN_TABLE. Read this for casting: ABAP OBjects – Narrowing Cast & ABAP Objects: Widening Cast . Ater implementing the Hotspot, we need to implement the Event Hanlder to handle the Hotspot. Here, we will implement the event listner method for the event LINK_CLICK of the class CL_SALV_EVENTS_TABLE. We need to set the handler of this events to let the system know, where to go when the event occurs. Note: Here we have used the class CL_SALV_COLUMNS_TABLE which is different than the class CL_SALV_COLUMNS discussed as in the previous post SALV Model 7 – Changing Column settings . co_report TYPE REF TO lcl_report. lo_col_tab  TYPE REF TO cl_salv_column_table. lo_col_tab ?= lo_cols_tab->get_column( 'VBELN' ). SET HANDLER co_report->on_link_click FOR lo_events. READ TABLE lo_report->t_vbak INTO la_vbak INDEX row. IF la_vbak-vbeln IS NOT INITIAL. MESSAGE i398(00) WITH 'You have selected' la_vbak-vbeln. SALV Model 1: Normal ALV Table Display. This code is very useful and easy to understand. For my requirement I want to show another ALV when I am click on vbeln. It should take it to that ALV, has related fields to vbeln. I impletmented the Initial Sample ALV it worked fine. But I am getting errors when I used the Hotspot functionality. Can you please mail the entire code for Hot spot and drill down functionality. I need to use the same in on of my deliverables. I have done normal ALV using OOPS concepts but wanted to try using the factory method. Otherwise the blog is very good and good initiative.